With the success of immune checkpoint blockade in some cancer patients, but failure in many others, scientists are always on the lookout for new checkpoints to target. The inhibitory receptor NKG2A is found on many NK cells and few CD8+ T cells in peripheral blood. It heterodimerizes with CD94 and, upon binding its ligand (the non-classical MHC class I molecule HLA-E in humans and its homolog Qa-1b in mice), it inhibits the immune cells’ effector functions. In two papers published in Cell, André et al. and van Montfoort, Borst, and Korrer et al. explored in several murine tumor models and human head and neck squamous cell carcinoma (HNSCC) whether NKG2A hampers the immune response in a cancer setting, and whether the brakes could be released with a blocking antibody. André et al. began by culturing NK cells with either wild type (WT) B cell lymphoma A20 cells, which express Qa-1b, or with Qa-1b-knockout A20 cells. The latter led to a higher frequency of activated NKG2A+ NK cells. In vivo, Qa-1b-knockout A20 cells developed tumors in far fewer mice than their WT counterparts, and tumor control was dependent on both NK and CD8+ T cells. Together, these results confirmed that the NKG2A/Qa-1b axis is a potential immunotherapeutic target. In A20 tumors, the majority of NK cells and about a quarter of CD8+ T cells were NKG2A+, with most of the latter co-expressing PD-1. To target these cells, André et al. developed an anti-mouse NKG2A antibody. In vitro, anti-NKG2A increased the activation of NK cells and, when combined with anti-PD-L1, boosted the frequency of activated NKG2A+PD-1+CD8+ T cells. In A20 tumor-bearing mice, while anti-NKG2A alone was ineffective and anti-PD-L1 somewhat increased survival, the combination of the two synergized to increase survival to 75% in a manner that was dependent on both NK and CD8+ T cells. In a separate RMA-Rae-1β T cell lymphoma model, monotherapies were ineffective, while the combination led to 45% survival rate and durable immunity; in this model, the antitumor effect was dependent on CD8+ T cells, but not NK cells. Having established NKG2A as an immune checkpoint in mice, André et al. explored its effect in human cancers. Numerous types of human cancers were found to express HLA-E, and several tumor types (such as HNSCC) were also infiltrated by NKG2A+ NK and NKG2A+PD-1+CD8+ T cells. Based on these observations, the researchers developed monalizumab, a humanized IgG4 anti-NKG2A antibody that specifically inhibits binding between human NKG2A and its ligand HLA-E. In vitro, monalizumab increased the activation and effector function of human NK and CD8+ T cells, and the addition of durvalumab (anti-PD-L1) boosted this effect. In addition, monalizumab in combination with either the anti-EGFR antibody cetuximab or with the anti-CD20 antibody obinutuzumab enhanced antibody-dependent, NK cell-mediated cytotoxicity. Based on the preclinical results, and on the fact that cetuximab is part of standard treatment for HNSCC, the researchers conducted a phase II clinical trial to evaluate the safety and efficacy of monalizumab and cetuximab combination in patients with previously treated (including nearly half previously treated with immunotherapy) recurrent or metastatic HNSCC. The combination treatment was well tolerated. Interim efficacy results showed 31% partial response, 54% stable disease, and 11% progressive disease in a cohort of 26 evaluable patients. The number of NKG2A+CD8+ T cells was selectively increased in the tumor, while it remained low in the whole blood and lymph nodes of the patients. In addition to this ongoing clinical trial, another trial evaluating the combination of monalizumab and durvalumab is ongoing. In a separate study, van Montfoort, Borst, and Korrer et al. found that in human HNSCC tumors, most NK cells and up to 50% of CD8+ T cells expressed NKG2A, while in peripheral blood, NKG2A was detected only on NK cells. The researchers noted that NKG2A was much more prevalent on CD8+ T cells in immune-reactive tumors, such as those with HPV16, suggesting that T cell activation induced the expression of the NKG2A checkpoint. In fact, RNAseq data showed that in patients with HPV16+ HNSCC, expression of NKG2A or its ligand HLA-E abrogated the positive survival benefit associated with high levels of NK or CD8+ T cells. Furthermore, biopsy analysis revealed that NKG2A expression on T cells was independent of other inhibitory checkpoint receptors, and NKG2A+CD8+ T cells mostly displayed an antigen-experienced, tissue-resident, early effector phenotype (CD45RO+CCR7-CD103+). With these analyses performed, the team explored how NKG2A expression affected the function of tumor-infiltrating cells, particularly in association with peptide vaccination. Utilizing an HPV16-induced carcinoma mouse model, the researchers showed that a previously developed synthetic long peptide therapeutic vaccine induced a strong CD8+ T cell response and delayed tumor growth, but ultimately the tumor progressed. Loss of tumor control appeared to be due to the vaccine-induced upregulation of NKG2A, PD-1, and TIM-3 on intratumoral CD8+ T cells. The frequency of NKG2A+ NK cells was not altered, and the early tumor regressions observed were dependent on CD8+ T cells, but not on NK cells. Armed with these observations, the researchers combined the vaccine with either anti-PD-1 or anti-NKG2A. Anti-PD-1 addition was ineffective, however, the addition of NKG2A blockade increased the response rate and further delayed tumor outgrowth. Anti-NKG2A monotherapy was ineffective, suggesting the need for an inflamed tumor microenvironment initiated by the vaccine in this cancer model. In the non-viral MC38 colon carcinoma model, the vaccine did not prevent tumor outgrowth and did not alter the frequency of intratumoral NKG2A+CD8+ T cells. 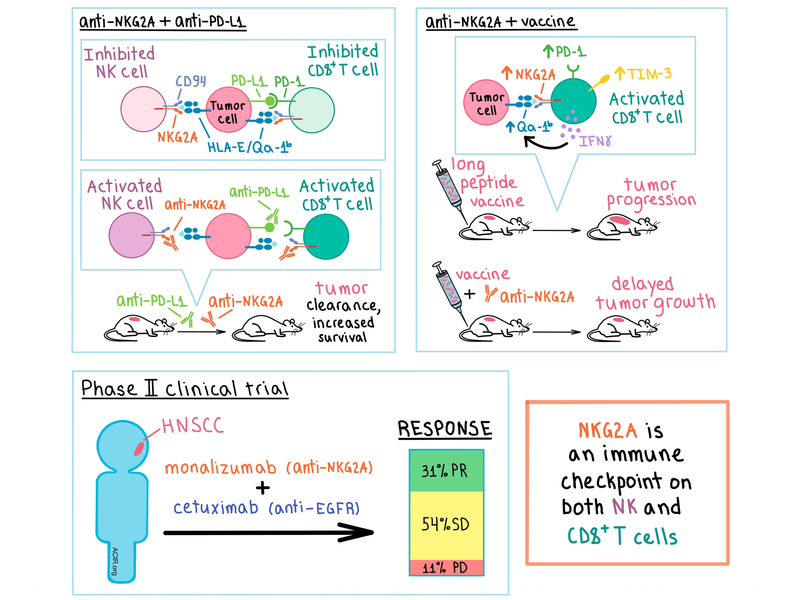 Nevertheless, the addition of anti-NKG2A increased survival, albeit modestly, compared with vaccination alone, suggesting that NKG2A puts the brakes on vaccine-induced tumor control. Taking a look at the other side of the receptor/ligand interaction, the team found that vaccination upregulated Qa-1b expression on tumor cells in multiple tumor models, and this effect was dependent on IFNγ produced by the activated T cells. In addition, Qa-1b expression on tumor cells, but not on host cells, was required for the NKG2A blockade’s antitumor effect. Overall, the two studies demonstrate that NKG2A is a newly validated immune checkpoint that inhibits intratumoral CD8+ T cells and NK cells, and that blocking the NKG2A/ligand interaction with an antibody releases the brakes on the immune cells and improves tumor control, particularly in combination with a therapeutic vaccine or with other immune checkpoint inhibitors. André P., Denis C., Soulas C., Bourbon-Caillet C., Lopez J., Arnoux T., Bléry M., Bonnafous C., Gauthier L., Morel A., Rossi B., Remark R., Breso V., Bonnet E., Habif G., Guia S., Lalanne A.I., Hoffmann C., Lantz O., Fayette J., Boyer-Chammard A., Zerbib R., Dodion P., Ghadially H., Jure-Kunkel M., Morel Y., Herbst R., Narni-Mancinelli E., Cohen R.B., Vivier E. Anti-NKG2A mAb Is a Checkpoint Inhibitor that Promotes Anti-tumor Immunity by Unleashing Both T and NK Cells. Cell. 2018 Dec 13.
van Montfoort N., Borst L., Korrer M.J., Sluijter M., Marijt K.A., Santegoets S.J., van Ham V.J., Ehsan I., Charoentong P., André P., Wagtmann N., Welters M.J.P., Kim Y.J., Piersma S.J., van der Burg S.H., van Hall T. NKG2A Blockade Potentiates CD8 T Cell Immunity Induced by Cancer Vaccines. Cell. 2018 Dec 13. In a phase I/Ib trial, 8 patients with newly diagnosed glioblastoma were treated with up to 20 long neoantigen peptides admixed with poly-ICLC in a prime-boost schedule following surgery and radiotherapy. Dexamethasone (dex) treatment for cerebral edema prevented T cell responses. Two patients who were not treated with dex during vaccine priming generated circulating, polyfunctional, neoantigen-specific CD4+ and CD8+ T cells that demonstrated an antigen-experienced memory phenotype. Neoantigen-specific T cells also infiltrated relapsed tumors, where they showed signs of cytotoxicity and/or exhaustion. Using peptidase or proteasome inhibition, Ma et al. show that in monocyte-derived immature dendritic cells, HLA-A1 cross-presentation of a MAGE-A3-derived long peptide occurs via the vacuolar pathway. While vacuolar cross-presentation has been considered to be TAP independent, in this case it was found to be indirectly TAP-dependent. TAP was required to load newly synthesized HLA-A1 molecules with suboptimal peptide, allowing them to bypass ER quality control and be transported to the vacuole for exchange with endocytosed peptide. TAP dependency therefore does not distinguish vacuolar from cytosolic cross-presentation. Poncette et al. found that NY-ESO-1-specific TCRs isolated from ABabDR4 mice – which express human HLA-DR-4-restricted TCRs, but lack tolerance-inducing human antigens – had higher functional avidity and recognition of NY-ESO-1-positive cell lines than NY-ESO-1-specific TCRs derived in vitro from human CD4+ T cells. In a mouse model of adoptive transfer in which HLA-DR-4 was expressed on host stromal cells but not NY-ESO-1+ tumor cells, the combination of CD4+ T cells with ABabDR4-derived NY-ESO-1 TCRs and NY-ESO-1-specific CD8+ T cells induced superior tumor regression, though it was short-term due to antigen loss. Bilich and Nelde et al. performed mass spectrometry-based HLA ligandome analysis of PBMCs from primary chronic myeloid leukemia (CML) in comparison to normal hematological tissues or CML patients in deep molecular remission to reveal a panel of novel, non-mutated, CML-associated target epitopes. Limited pre-existing epitope-specific T cells were observed in CML patients, but in vitro priming resulted in multifunctional, cytotoxic, peptide-specific CD8+ T cells for most tested epitopes in both healthy volunteer and CML patient samples. Viral epitope-specific CD8+ T cells in patients being treated with TKIs showed reduced functionality.